Often we have seen Indian parents rebuking their children’s underperformance in school by equating them with people residing at the lowest stratum of the society. Rag pickers, the boy at the tea stall, sweepers, etc. often feature in these discussions as if life had given them various choices to opt from. While most of us continue to use their plights to rebuke our younger siblings or children, seldom do we really think about these downtrodden people in a positive way – that they may really have crossed a thousand hardships to be where they are – let alone help them cope with their adversities. Working amidst landfills made completely out of garbage, which is prone to frequent collapses and unsolicited fires, is never easy. One has to risk his/her life 24×7 to bring (hardly) a square meal to the family. And breathing the polluted air is something we are not even talking about here. This scene is almost the same for all the waste landfills in India – people scavenging over piles of waste products to earn a livelihood. However, for the landfill dwellers in Ghazipur, this took a surprisingly brighter turn a few years back thanks to Gulmeher Green Producer Company. Gulmeher Green Producer Company started off as a social enterprise that would specifically aim at training women garbage pickers. Based on their expertise, they are trained in collecting and segregating the trash with professional skills, enabling them to live a decent life out of the trash hole (both literally and figuratively) that they have been residing in. Started with around 30-odd women, Gulmeher would specifically work with the women because the men always had other options to livelihoods – such as being a labourer or a rickshaw-puller – while women (who always preferred to remain closer to their homes for reasons more than one) stuck on to the more unhygienic job of picking waste from the landfills. The initiative started way back in 2013 when the erstwhile Infrastructure and Financial Services company IL&FS started working on a project to divert waste away from the landfill in Ghazipur, through its waste-to-energy plant. Now, while this initiative would mean a great bonanza for the people living in and around Ghazipur, for the 400-odd families making a living out of the landfill, the announcement was no short of a nightmare. This is when IL&FS began working towards providing alternative livelihood to the affected people through its CSR wing, which is known as the Nalanda Foundation. Nalanda Foundation then started implementing various initiatives in that area, one of them being Gulmeher Green Producer Company. Few years into this business, Gulmeher is an eco-friendly, responsible company that have turned the waste-pickers not just into creators, but also shareholders in the company. They pick up waste flowers, plastic and paper, and recycle them to make photo-frames, diaries, and calendars with neat detailing. No doubt this, too, is a laborious task – the women at Gulmeher go to the Ghazipur flower market every morning, to segregate and pick flowers from the unsold trashed lot, painstakingly separate the leaves and the petals, and sun-dry them carefully before turning them into pieces of art. Yet, this life is far, far better and emancipating them from the life they led on mountains of garbage. When Gulmeher was just established, the women rag-pickers were given literacy and financial management lessons, which sadly did not work properly. For people who have toiled most of their lives as labourers, the urge to work is so much so that the patience to imbibe words and numbers ceases to have any effect. The same happened with these ladies at Gulmeher. Thankfully, Gulmeher’s mentor Anurag Kashyap understood this pretty early and introduced classes that would work towards enhancing the skills these women already had. For example, they were imparted with knowledge about embroidery and tailoring, and how they could create eco-friendly products from the raw materials that were readily available around as waste. Under the expert guidance of a professional designer, the women learnt how to cut and arrange flower petals and leaves into intricate patterns inspired by nature and wildlife. Needless to say, the women have come a long, long way since then – not just creating diaries and greeting cards but even making intricate, life-like portraits of celebrities across the globe. As Holi approaches, the ‘Rang Birangi’ unit of Gulmeher is working relentlessly to turn flowers and vegetables into eco-friendly and skin-friendly chemical-free colours. The hard work of the women is captivating – it’s a lot of work for sure, but it allows them to earn about Rs 10,000 per month, which some of them never thought they could ever earn. It helps them pay for their children’s education, or to save up for the unknown future or simply save up for their daughters’ marriage. 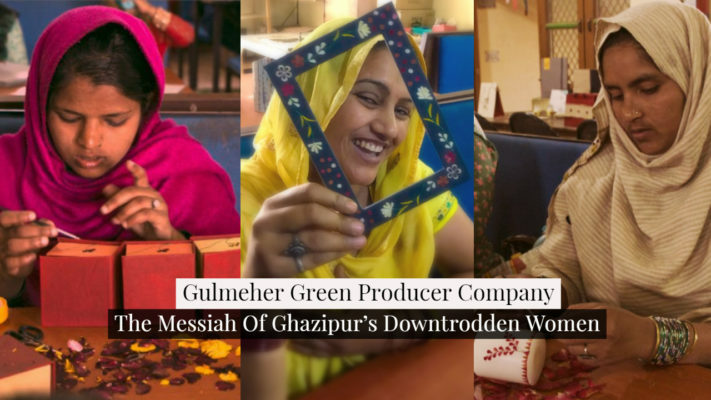 Above all, what’s most promising is the fact that the regular employees of Gulmeher have a steady job, which credits the salary right on time in their bank account. In short, they have emerged as modern, emancipated women, who run an entire company and have brought smiles across the faces of their family members amidst all odds. “So far, the women have recycled 7,000 kilograms of paper and kept 15 tonnes of discarded flowers out of the landfill. Gulmeher’s products carry stories of transformation, but they’re beginning to command a market based on their professional craftsmanship, not just because they tug at the heartstrings. We’re sitting atop a virtually inexhaustible resource, the gold mine of the future—garbage. So, once we carve out a niche for ourselves, it’s just a matter of scaling up and replicating this model to empower many more waste-pickers across the country with sustainable alternative livelihoods so that they can lead a life of dignity,” Kashyap says. And his words couldn’t have been truer – after all, these ladies literally minted gold out of trash!